Easter was last Sunday and in addition to candy wrappers & dyed fingertips, you're left with a dozen empty plastic eggs from the neighborhood Easter Egg Hunt. You don't want to throw them away, but they can't be recycled. You still have empty plastic eggs from the egg hunt last year, and the year before that, and the year before that. On one hand, you could contact the coordinator of an egg hunt and let them know you have tons of eggs to donate next year. On the other hand, your kids could continue to have fun with the eggs and learn at the same time! 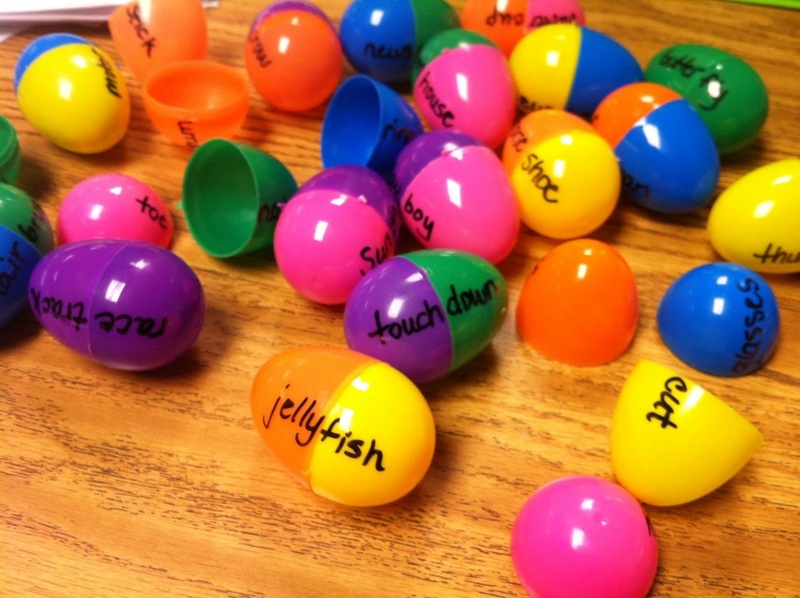 Here are some eggciting ways to teach reading, math & science to your kids using plastic eggs. Who knew eggucation could be so fun! 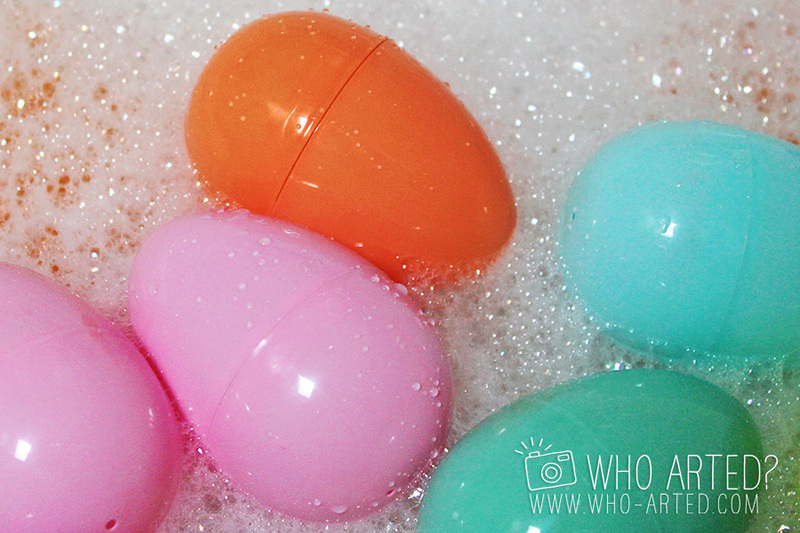 The easiest way to have fun with empty plastic eggs is to throw them in the bathtub! What child wouldn't enjoy sitting in a bathtub with bright, colorful, floating eggs! Your child will enjoy opening the eggs, filling them with water, and closing the eggs trying to keep in as much water as possible, only to find out that the water escapes from the holes at the top/bottom of the eggs. All this play is actually teaching your child science concepts. Your child will discover that if he/she holds a water-filled egg very still, no water will come out of the holes (due to surface tension), but upon shaking it, the water will come out. Your child will be experimenting with trying to make the eggs sink and will delight in finding out that they can fill the eggs with water by simply immersing the closed eggs into water, thanks to the holes at the top/bottom of the egg. This year, we took the idea from Who Arted? and added bubble bath, hid Legos and plastic animals inside the eggs, and had a bath time egg hunt! This creative idea from Gluesticks will make even your pickiest eater excited to have lunch! 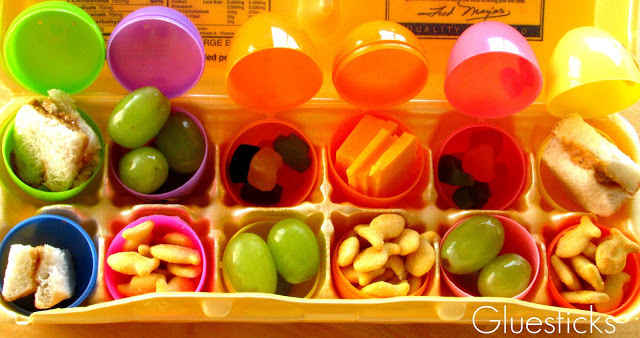 Simply fill each egg with different lunch items (sandwich bites, goldfish, fruit, cheese, etc.) and use an egg carton to hold the eggs up. You might even stick a tiny piece of chocolate in one of the eggs and have your child hunt for the chocolate. The only rule is that he/she has to eat whatever egg they've opened until they've found the chocolate! 1, 2, 3... Egg Math is For Me! Prepare your eggs by separating the egg tops from the bottoms and using a sharp knife to remove the sharp nub. Do not use scissors because they doesn't take off the whole nub! Number Recognition - Write each of the digits 0-9 on both halves of 10 eggs so that when the eggs are closed, the numbers are side by side. Separate the eggs and mix them in a pile in front of your child (or scatter them around the house/yard for another egg hunt). Have your child find each pair and say the number when a match is made. 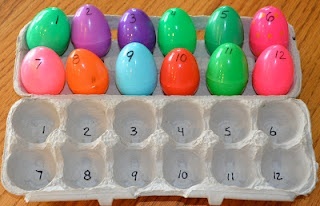 Ordering Numbers - Have your child put the eggs in an egg carton in order from least to greatest. 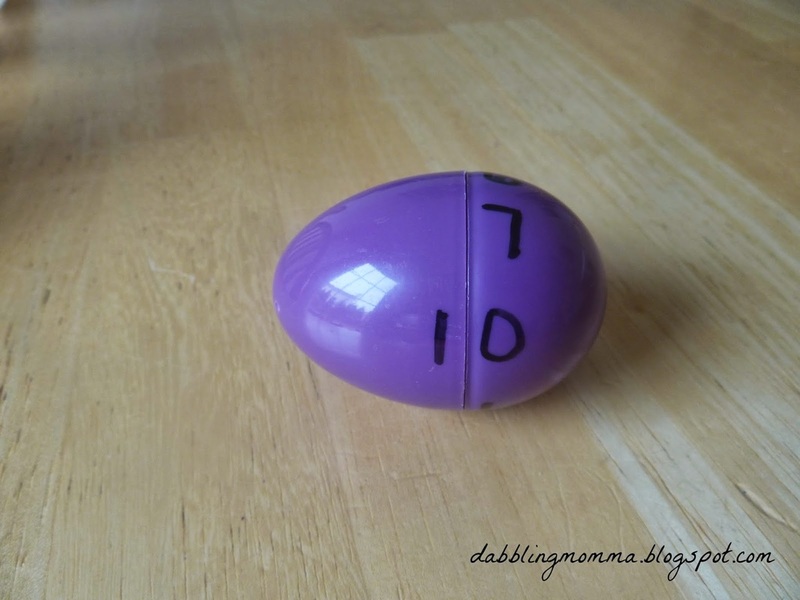 For younger kids, write the numbers on the egg carton and have them match the egg to the space in the carton and then practice saying the numbers in order. You can even string the egg halves up and make a snake or caterpillar. Counting, Matching Quantities, 1-1 Correspondence - Draw a number on one half of an egg, and draw that number of dots on the other half of the egg. Separate the eggs and have your child make matches. 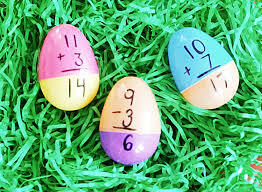 Recognizing & Ordering Larger Numbers - Write the numbers 0-9 on both halves of one egg, so that when the halves are rotated, a new 2-digit number is formed. Have your child practice saying the numbers. Make multiple eggs to practice ordering 2-digit numbers. Addition, Subtraction, Multiplication, Division Facts - Practicing basic math facts is way more fun with eggs than flash cards! Simply write the problem on the top portion of the egg and the answer on the bottom portion of an egg. To make it harder, make sure that colors aren't matched when you write the math fact! Matching Uppercase Letters to Lowercase Letters - Write the uppercase letter on one half and the lowercase letter on the other half. Separate the tops & bottoms, mix them up, and let your little one play (and learn). 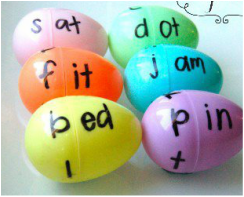 Compound Words - Write the first half of the word on the top part of the egg. Write the second half of the word on the bottom part of the egg. Let your kid mix and match, read the word and have fun! At one time or another, most of us have (or will eventually) hear the words, "I'm bored." With all the warnings to limit screen time (TVs, computers/tablets, & smart phones) and when the weather is too cold/wet to go outside, wouldn't it be nice to suggest something to your kids at times like these and not hear whining that starts with, "But..."
Usborne Books & More has a wide selection of sticker books and activity books that are not only boredom busters, they help in your child's development and learning. Click here to read more. The best gift is the gift of TIME. We have all said at one time or another, "I don't have time." Whether it be to playing a game with your children, or going on a date with your significant other, or doing a house-project that's been on hold for years. Even with smart phones, social media, and all the conveniences we now enjoy, we simply can't be in two places at once. I can't solve everyone's time-constraints, but I can offer a solution for those looking to spend quality time with their child, aid in the education of their child, boost their child's self-confidence, encourage their child's imagination, build their child's vocabulary and have fun, all at the same time. Talk about multi-tasking! Click here to learn how reading creates time! 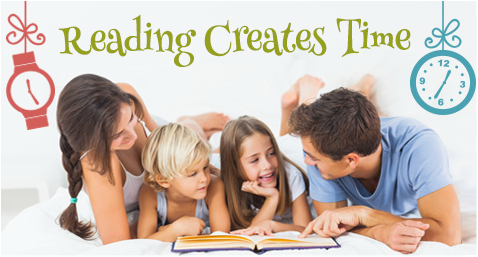 This blog contains information for parents & caregiver surrounding literacy and it's importance, including what skills are learned by different types of books, tips for helping struggling readers, & tips for carving time to read with your kids.